There are different ways a Harry Potter fan can experience the magical world from the books. 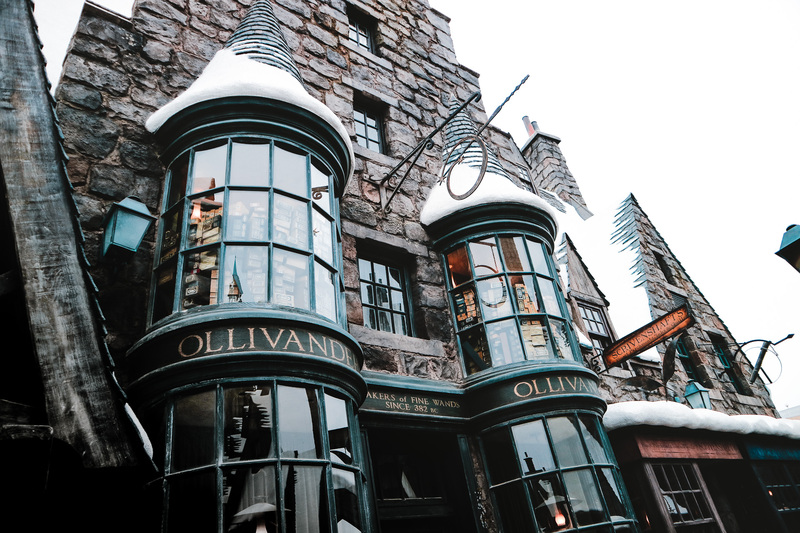 You could do the official studio tour in London or visit a few film locations in Oxford, but going to the Wizarding World of Harry Potter in Hollywood, Orlando or Osaka is the next best way to feel like you’re a Hogwarts student. J.K. Rowling has crafted a world so believable that seeing them come to life on film makes Harry Potter fans wish they’d been cast in the film to walk through the halls of Hogwarts or visit the only Wizarding village in Britain, Hogsmeade. Fret not, dear Muggle, for if you find yourself in Los Angeles, California, your fastest way is by visiting the Wizarding World of Harry Potter in Hollywood. This theme park is situated inside Universal Studios Los Angeles. Though not as complete as the one in Orlando (they’ve got a Diagon Alley), there’s still loads to do in this one. Here are the things you can do when you want to spend a day at the Wizarding World of Harry Potter. Mind you, it’s a list to help us Muggles have a magical time. Even as you enter Universal Studios gates, you can see the spires of the Wizarding World of Harry Potter from afar. Go as early as you can to beat the crowd. When I visited with my best friend and her family, we went as early as 8 am. Waking up at 6am was so worth it. I was so excited I didn’t even have jet lag having arrived in Los Angeles from Manila the day before. Once you see the Wizarding World, you might be tempted to rush in–I was–but take a moment to enjoy the anticipation. Before you transport yourself into Hogsmeade, take a photo at the gates. The backdrop already looks magical. As soon as you step into the Wizarding World, you’ll be in Hogsmeade. On your right is the Hogwarts Express. There’s even a conductor there to welcome you and the conductor is in character. I felt like I was back in England when he conversed with us. Naturally, we had our photos taken here. The whole theme park is so photo worthy. I wish I’d come in costume to fit in some more. WANT TO BLOG & TRAVEL? 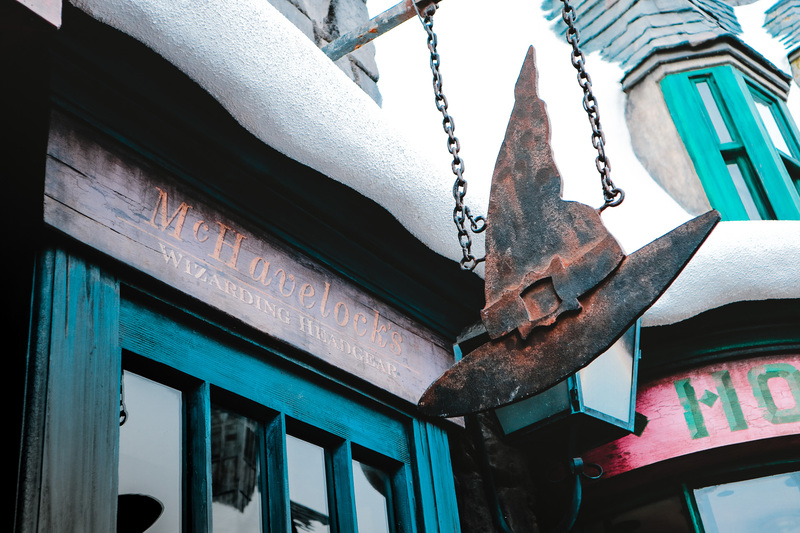 Aside from the Hogwarts Express, one of the first things you will see are the stores in Hogsmeade: Honeydukes, Three Broomsticks, and of course Zonko’s Jokeshop! It’s hard not to go crazy with all the things you can buy. Save up and really budget for when you visit because you’ll want to buy everything! From the sweets in Honeydukes to an official Hogwarts robe (that costs about $100!)! There are loads of treats that you’ll want to hoard and stock up on in Honeydukes. The store is also so colorful that you won’t know where to look or what to get! Of course, you’ll find those famous chocolate frogs in here. I wanted to scream of happiness when I saw it. It reminded me of the time I did the studio tour in London and saw the huge replica of the Hogwarts Castle and cried from happiness. I heard it’s also magical at night especially when there are light shows. Dine like a wizard or witch and indulge in English food at The Three Broomsticks. Pair your meal with a cup of butterbeer! You enter through a cave, but before you ride, you will be required to leave all your things in a locker. Instead of a key and lock, your fingerprint will be used to secure your valuables. Queuing in line for the forbidden journey requires you to enter the Hogwarts Castle where you will see many elements from the movies: moving portraits (I heard they update these every now and then! ), an actual prop from the movie, the mirror of Erised and The Sorting Hat among others. We got to ride the Forbidden Journey twice since the line wasn’t long yet. The ride exits to a souvenir shop–so strategic–called Filch’s Emporium. There are so many items to choose from like a Marauderer’s Map that lights up, but I settled on getting a keychain of the time turner. It’s also said that they sometimes bring out The Sorting Hat that really sorts you. Keep an eye out for that when you’re in this souvenir shop. Right outside the Hogwarts castle you will see a stall selling wands, but we went inside Ollivanders to get our wands. You might as well get the full experience of buying a wand at Ollivanders and if you’re up for the wait, experience the wand choosing ceremony. You’ll get so excited and maybe a little overwhelmed with the choices. Should you buy a character wand or a more unique one? Should you get an interactive wand? I purchased an interactive wand because I wanted to feel like Hermione casting spells around the park. It’s more expensive than the regular one, but worth it. This is the wand I chose. It’s an oak wand, which symbolises confidence and optimism. The fun part about buying an interactive wand is going around the park, casting spells and watching the magic happen. There are spots labelled with numbers (on the floor) that indicate where you can use your wand and a symbol that you’re supposed to make with your wand to perform the spell. It was announced earlier this year that there are already 15 spells that you can perform throughout the park. Experience the thrill of sending a message through the owl post and your card will be stamped with a Hogsmeade stamp. My friend and I purchase this postcard from The Owl Post and then sent it at one of the post boxes outside. This is the only other ride aside from The Forbidden Journey. The Flight of the Hippogriff is like a mini-roller coaster ride. Near the Flight of the Hippogriff is a stone platform where Hogwarts students and their toads perform musical numbers throughout the day. Of course you have to try the butterbeer! The first time I tasted butterbeer at the official studio tour in London, I didn’t like it. But this butterbeer on the other hand was delicious. Who care about the calories… you’ll be walking it off anyway! You can order butterbeer in one of the stalls outside the shops or at The Three Broomsticks. Maybe this is one of the first things you would do. Whether it’s an interactive wand at Ollivanders, an official Hogwarts robe or a chocolate frog from Honeydukes, it’s always nice to bring back a little piece of magic with you at the end of the day. Have you ever been to the Wizarding World of Harry Potter? What was your experience like? Very detailed description!! Loved the post !! Thank you! Have you ever been to the Wizarding World of Harry Potter? I am so looking forward to going there, thanks for this! Thank you too! It’s such a magical place. Enjoy! !